“I hadn’t planned on driving,” I responded. We have been together since we were 17, as such, we employ some very “sibling-esque” approaches to Conflict Resolution. These solutions resemble the sophomoric ways a brother and sister would solve an issue, much more than a committed mature adult couple. So, I cranked the heat up, (Jimmy HATES to be hot) and turned the radio dial to Christian Talk Radio. I knew it wouldn’t be long until he started craving both AC and AC/DC, but I was wrong. All I can say, is that he would’ve made an excellent POW during one of the wars, as I was never able to “break him” and ended up driving us all the way to Fayetteville. To amuse myself while driving, I planned my “Game Day Ensemble” in my head. I was a little distracted thinking about my limited fashion options. For starters, I don’t own a lot of Arkansas-red clothing; as a Red-head, I was brought up believing that red garments clash with orange hair. And, secondly, the Razorbacks really need a textile! At some point during the Bear Bryant years, the University of Alabama adopted the houndstooth fabric as their “signature fabric”. The Alabama fans sport this print in everything from baseball caps to rain galoshes. As we were checking into our hotel, I was preoccupied catching up with texts, (because – driving) when I overheard Jimmy having a discussion with the hotel clerk. Now, if Jimmy balked at spending $400 money on a dog, you can just imagine how recalcitrant he is going to be to buy a poncho, on the off-chance someone else is going to be selling them cheaper somewhere else. I can also tell he is thinking that it’s quite possible the weatherman is wrong and there isn’t actually a 95% chance of rain. What if we spend that money and don’t end up needing those ponchos? He’s planning to sleep on this decision. So, exhibiting the financial recklessness he so often accuses me of, I boldly, with wanton disregard for our financial future, shelled out $10 for 2 ponchos. The next morning, when it was time to leave for the football game, Jimmy reclaimed his manhood and got back in the driver’s seat. We had barely driven out of the hotel parking lot, when we noticed the flat tire. He spent the next two hours changing the flat, getting the tire repaired and cussing up a storm, (no pun intended) in the aforementioned rain. But, honestly, you never heard such language. 2. Aren’t you glad I bought us those ugly rain ponchos? I bet he drives next time! Well played! Thank you for another injection of humor for the day. 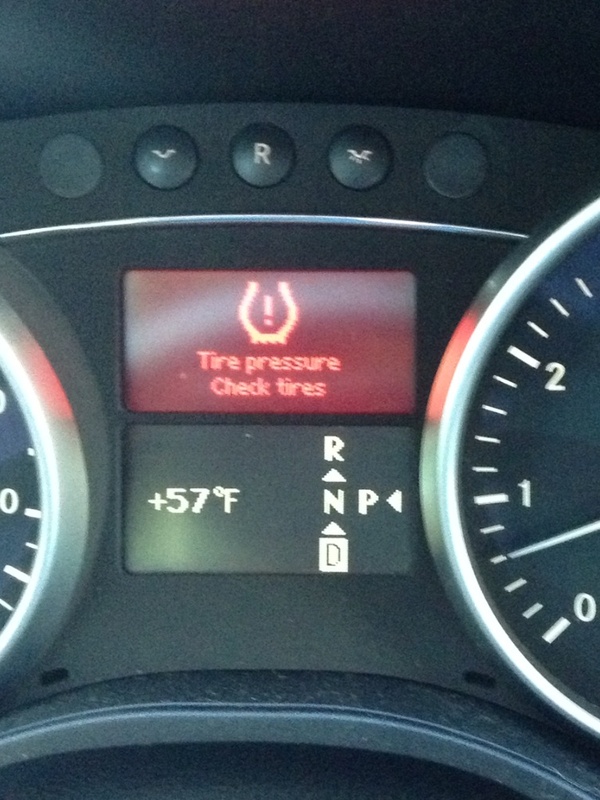 uh oh…I’ve been driving with that same little light on…glad it’s not raining!